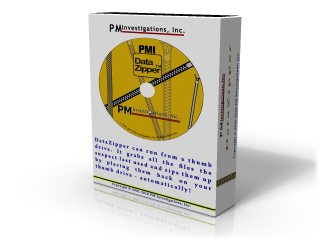 DataZipper – PM Investigations, Inc.
A simplified application to quickly collect data from a computer. DataZipper allows you to retrieve documents, Excel spreadsheets and other file types while using it from a thumb drive. It’s really simple. You go to a suspect’s PC and need to grab the Documents and Pictures, but the standard location of where the documents are has been changed! You want to know what folders he’s accessed last and grab them too. Oh, and by the way – you want his favorite web sites he’s booked marked and his cookies….How do you grab them all at the same time? And then zip them up? A hide button to make the program disappear and re-appear when you click on the ICON (look where the system time is). Auto timer and Auto Path allows this program to run completely in stealth mode. By setting the length of time in the configuration file, you can zip up the contents without clicking a single button. Additionally, you can use this application to move your files back and forth between your computers.